Which Begonias Tolerate Hot Sun? Though typically recommended as shade plants, several begonia varieties (Begonia spp.) grow well in full sun. As tropical plants, they have the added advantage of thriving in hot weather. Wax begonias and other sun-tolerant varieties like "Dragon Wing Red" and the "Big Series" are hardy in U.S. Department of Agriculture plant hardiness zones 10 through 11. They are grown as annuals in cooler zones. Begonias may have single or double flowers. Wax begonias (Begonia x semperflorens-cultorum) are the best begonias for sun, heat and drought tolerance. Varieties with bronze-colored foliage are the best for full-sun conditions. The cultivars "Victory" and "Cocktail" are two examples of bronze-colored wax begonias. Modern cultivars with green leaves can also grow in sun so long as they receive afternoon shade. Wax begonias are compact, busy plants that reliably flower throughout the entire summer. Several of the begonia varieties with wing-shaped leaves are also very sun-tolerant. "Dragon Wing Red" begonia (Begonia "Bepared") grows best in full sun to part shade, and prefers some afternoon shade in warm climates. Begonias in the "Big Series" (Begonia x benariensis Big Series) are slightly less sun tolerant, preferring dappled sunlight throughout the day, though they will grow in full sun. Both these varieties are noteworthy for their tolerance to hot, humid summers. In gardening, the term "full sun" refers to locations where plants receive at least 6 hours of direct sunlight every day. Begonias do best when they get this sunlight in the morning and late afternoon, with shelter from the most intense mid-day sunlight. The bronze-leaved wax begonias are the begonia varieties most likely to thrive in hot sunlight without afternoon shade. 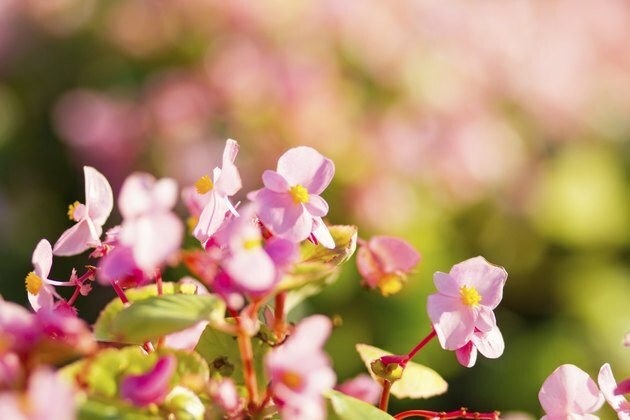 Keeping begonias healthy by providing good growing conditions helps them survive stressful conditions like hot, intense sunlight. 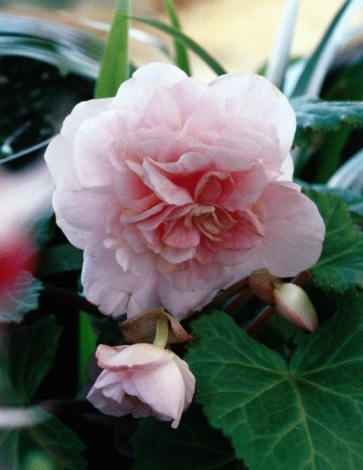 Begonias prefer moist, well-drained soil rich in organic matter. When you're growing begonias in full sun, water enough to keep the soil mist but not soggy. So long as the soil is fertile, begonias need little fertilization. If you amend the soil with well-rotted manure before planting begonias in the spring, they won't need supplemental fertilizer. In nutrient-poor soils, use an all-purpose plant food that contains 5 or 10 percent nitrogen. This means that the first number in the fertilizer's N-P-K ratio will be 5 or 10. The values of the other numbers are not important for begonias. Apply fertilizers with 5 percent nitrogen at a rate of 1/2 pound per 25 square feet every month during the growing season. For fertilizers with 10 percent nitrogen, apply 1/4 pound per 25 square feet. When Do Begonias Come in Season?